Laura Joplin, began exploring the practice of yoga in search of techniques that would help with her ultimate goal, liberating her mind and body. 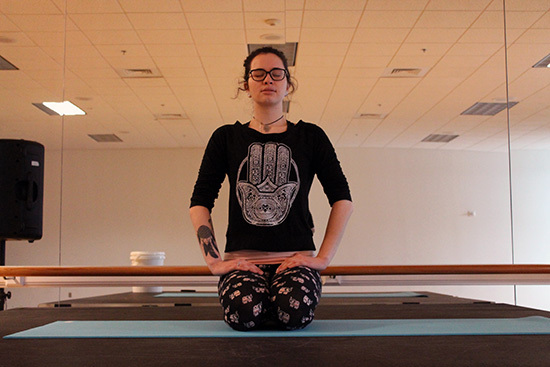 Through the years, the once amateur yogi has become the instructor, guiding four-sessions per week at the University Campus Center. Training for an instructor is the most important factor in creating an effective yoga maestro. Potential instructors may take as many as 200 hours of training leading up to actually instructing a class themselves. “I started teaching at the UWG in the middle of last semester, when I started teaching I had only one class, but this semester I have upped it to four,” Joplin said. Yoga, the word, lends its roots to the Sanskrit word ‘Yuj’ which in the most simplest of terms means to join or unite. But joining or uniting with what? Are we becoming one with our yoga mats? In ancient texts, it is said that the practice of yoga is a means of merging your (the yogi’s) consciousness with the overall consciousness of the universe, multiverse or whichever word you use to describe our vast cosmologic being-ness. But do not let this complex explanation of the art form deter you from participating in one of the cosmos’ most enlightening and soothing experiences. Though it seems complex from the outside looking in, those who are truly interested in mind and body fitness should be encouraged. However there is one thing you cannot teach, and that is what Laura says is the deal breaker for those in limbo. Yoga, at its core, is meant to be a way of obtaining peace or tranquility, even at the mercy of our modern world. After Joplin and her class finish the final meditation of the session, she habitually concludes with “Namaste”. Joplin is teaching four class sessions per week that anyone with access to the Campus Center can attend. Her classes meet at 8:30 p.m. on Tuesday, and at noon on Wednesday, Thursday and Friday.